Inside that part of the solar atmosphere, a region known as the corona, Parker Solar Probe will provide unprecedented observations of what drives the wide range of particles, energy and heat that course through the region—flinging particles outward into the solar system and far past Neptune. The corona through which Parker Solar Probe flies, for example, has an extremely high temperature but very low density. Think of the difference between putting your hand in a hot oven versus putting it in a pot of boiling water (don't try this at home! )—in the oven, your hand can withstand significantly hotter temperatures for longer than in the water where it has to interact with many more particles. Similarly, compared to the visible surface of the Sun, the corona is less dense, so the spacecraft interacts with fewer hot particles and doesn't receive as much heat. To make sure the instrument was ready for the harsh environment, the researchers needed to mimic the Sun's intense heat radiation in a lab. To create a test-worthy level of heat, the researchers used a particle accelerator and IMAX projectors—jury-rigged to increase their temperature. The projectors mimicked the heat of the Sun, while the particle accelerator exposed the cup to radiation to make sure the cup could measure the accelerated particles under the intense conditions. 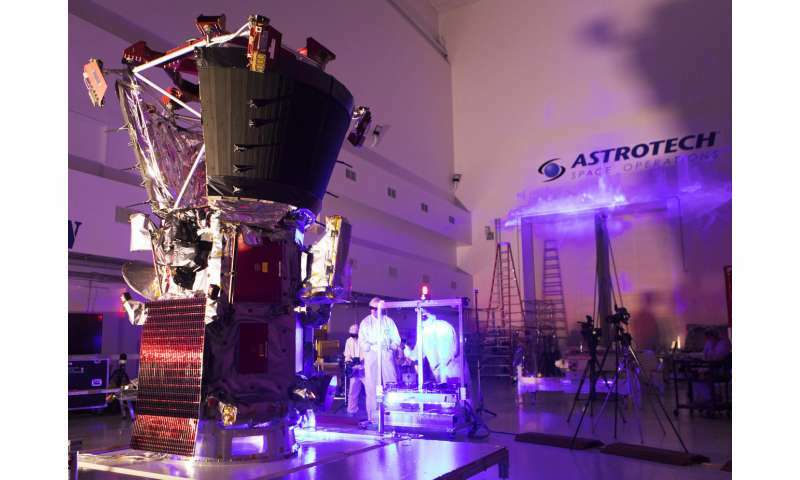 To be absolutely sure the Solar Probe Cup would withstand the harsh environment, the Odeillo Solar Furnace—which concentrates the heat of the Sun through 10,000 adjustable mirrors—was used to test the cup against the intense solar emission. The Solar Probe Cup passed its tests with flying colors—indeed, it continued to perform better and give clearer results the longer it was exposed to the test environments. "We think the radiation removed any potential contamination," Justin Kasper, principal investigator for the SWEAP instruments at the University of Michigan in Ann Arbor, said. "It basically cleaned itself." 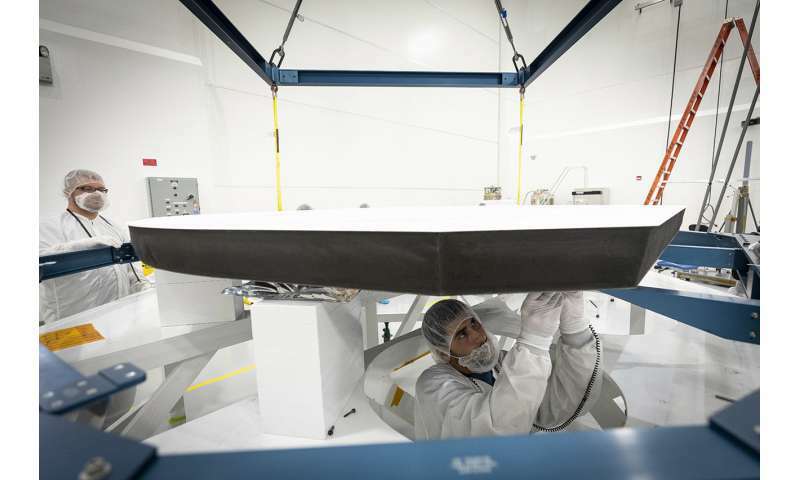 Several other designs on the spacecraft keep Parker Solar Probe sheltered from the heat. Without protection, the solar panels—which use energy from the very star being studied to power the spacecraft—can overheat. At each approach to the Sun, the solar arrays retract behind the heat shield's shadow, leaving only a small segment exposed to the Sun's intense rays. Over the course of seven years of planned mission duration, the spacecraft will make 24 orbits of our star. On each close approach to the Sun it will sample the solar wind, study the Sun's corona, and provide unprecedentedly close up observations from around our star—and armed with its slew of innovative technologies, we know it will keep its cool the whole time. Looping images are 'really' annoying. Please, stop including pointless,looping animations in the articles; all they do is give readers a headache. Thankfully, I have [Click to Remove]. Why don't they just go at night? Oh Mister Science Guy JD. Is it true, that if I shuffled my feet on the carpet as I approached the Electric Sun, when I reached out to touch it, that my finger would get statically sparked? My orange neon discharge tube does not get hot to the touch, why? What other color would neon be? Anyone wanting to get a real feel for this, watch the movie, "Sunshine" which was a terrific scifi. Thanks to the author for putting the part about heat vs. temperature in the article. This is something that many people get confused over. If only we could focus more on science like this to increase our understanding of the universe and our part of it. Instead of politics, capitalism, and the media that consume most of us. Heat will not likely be the issue for the SPP, charge density will be of more importance. First, a sheath (or series of them) will very likely form around the probe so the measurements may not reflect pure corona conditions. Secondly, given the highly filamentary and structured nature of the corona the probe may induce plasma discharges which will result in safe mode operations. The probe may very well experience anything but smooth sailing within the corona. Why do we have these Velikovskian acolyte poster boys pushing the electric universe into every ones consciousness, and the heading commentary to boot? Of course, the teams that designed the probe know that their tests are based on getting conditions as close to real during the simulated conditions and that there might (more like will) be things they didn't foresee, but it's an impressive feat of engineering nonetheless. The corona has a higher temperature than the surface of the sun, but the surface is hotter due to the higher density. Let's see how long this lasts. Will it last the entire seven years? Probably. But the scientists have considered that it might not last that long. Even if it fries in short order, there will still be a lot of data to go over. Yeah, I bet they never thought of that! Too bad the SPP can't return to Earth to be examined after being through the corona. We'll hope they did, fortunately they typically rely on engineers who don't dally in the funny farm physics astrophysicists use. That said, the Safire experiments show there may be a much higher thermodynamic response than expected due to the electric properties of plasma. Wrong. Pointless trying to engineer something for an environment only believed in by cranks. They'll use the same science as the physicists. It's not like there haven't been other probes that got close to the Sun. Too bad they couldn't figure out a way to actually take a photograph of the Sun as they headed towards it. It would be white, we are told, as opposed to the orange they always show. Err, I'm so sorry - what relevance does this lunacy have to actual science? Since when has sticking a squillion volts through a metal ball had anything to do with astrophysics? Do please explain this. Personally, I think it's crap. Prove me wrong. Oh, Jesus. This is the loon who thinks the Sun is invisible in visible light! Screw me, we have a full deck of loons! If your that interested in Jesus, milnic does a good line in spirits - spiritual entities of the universe, not the ones that involve being as drunk as a lord, keep up the good work, just remember this is a limit as far as expletives go - just like the good old times, they were the days J.D! "Oh, Jesus. This is the loon who thinks the Sun is invisible in visible light!" Still waiting for someone to offer some solid experimental science that it IS visible from clear space. Not even Goddard can provide me with that. Maybe you could build a, oh, I don't know... maybe a steam powered rocket, Solon, and go find out for us. Here's a picture of the sun in visible light taken from the Solar Dynamics Observatory satellite: https://www.nasa....ngstrom/ . That would seem to be definitive proof, unless you believe there's a conspiracy among the many engineers and scientists involved. In which case, you're a loon and a conspiracy nut. Oh, sorry. I've reviewed some of your comments. You are a loon. "Here's a picture of the sun in visible light taken from the Solar Dynamics Observatory satellite:"
That wavelength should be seen as blue/violet, not yellow. And if you do not understand how SDO works then you shouldn't be pretending to know anything about science.